Mol. Cells. Mar 31, 2019; 42(3): 245-251. Ependymal cells constitute the multi-ciliated epithelium, which lines the brain ventricular lumen. Although ependymal cells originate from radial glial cells in the perinatal rodent brain, the exact mechanisms underlying the full differentiation of ependymal cells are poorly understood. 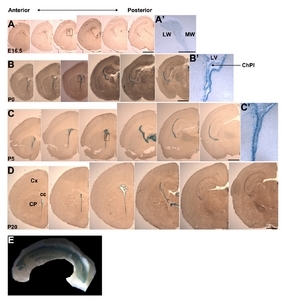 In this report, we present evidence that the Anks1a phosphotyrosine binding domain (PTB) adaptor is required for the proper development of ependymal cells in the rodent postnatal brain. 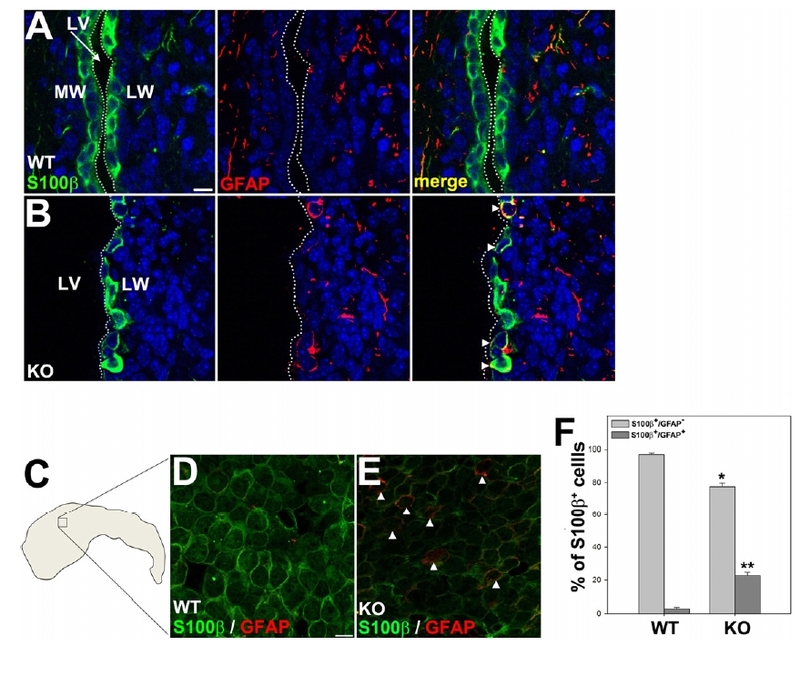 Anks1a gene trap targeted LacZ reporter analysis revealed that Anks1a is expressed prominently in the ventricular region of the early postnatal brain and that its expression is restricted to mature ependymal cells during postnatal brain development. In addition, Anks1a-deficient ependymal cells were shown to possess type B cell characteristics, suggesting that ependymal cells require Anks1a in order to be fully differentiated. Finally, Anks1a overexpression in the lateral wall of the neonatal brain resulted in an increase in the number of ependymal cells during postnatal brain development. Altogether, our results suggest that ependymal cells require Anks1a PTB adaptor for their proper development. Radial glial cells (RGCs) play pivotal roles in generating new neurons and providing a scaffold for neuronal migration during embryonic and perinatal brain development (Kriegstein and Alvarez-Buylla, 2009). During postnatal brain development, RGCs gradually transform into terminally differentiated cell types, such as ependymal cells and astrocytes, although some remain as RGC-like neural stem cells in spatially restricted brain regions (Ihrie and Alvarez-Buylla, 2011). This developmental differentiation of RGCs into various cell types in the ventricular zone (VZ) and subventricular zone (SVZ) is a dynamic, finely tuned process. This process may change in response to various physiological and environmental stimuli (Manzini and Walsh, 2011). Abnormalities in these developmental dynamics of RGCs during postnatal brain development may eventually lead to imbalance in the production and connectivity of neurons, which is an underlying cause of developmental brain disorders such as autism and schizophrenia (Neale et al., 2012; Ohata and Alvarez-Buylla, 2016). The adult brain ventricles are lined with a layer of ependymal cells, which are multi-ciliated and play an essential role in facilitating the flow of cerebrospinal fluid (CSF) through the ventricular system (Ohata and Alvarez-Buylla, 2016). Although ependymal cells are generated mainly from RGCs during embryonic brain development, their maturation begins with caudorostral and ventrodorsal direction along the lateral wall (LW) of the lateral ventricle (LV) during the first postnatal week (Spassky et al., 2005). Expression of the forkhead transcription factor FoxJ1 is required for the differentiation of RGCs into ependymal cells in the postnatal mouse brain (Jacquet et al., 2009). Target genes regulated by FoxJ1 encode microtubule-associated proteins implicated in ciliogenesis and cell junctional proteins. In addition, the homeobox transcription factor Six3 is necessary for ependymal cell maturation in the postnatal brain through suppressing RGC characteristics (Lavado and Oliver, 2011). Evidence indicates that ependymal cells inherit the planar cell polarity (PCP) set-up of the primary cilia in RGCs (Mirzadeh and Han et al., 2010). Subsequently, both intracellular PCP signaling and hydrodynamic forces exerted by the emerging CSF flow are critical for the docking and rotational orientation of motile cilia in mature ependymal cells (Guirao et al., 2010). Therefore, developmental defects in ependymal cells cause hydrocephalus because the coordinated beating of the multi-cilia and the subsequent stereotypical flow of the CSF are disturbed (Tissir et al., 2010). After complete differentiation, multi-ciliated ependymal cells do not divide any more under normal conditions. However, they may function as adult neural stem cells only in response to brain injury such as stroke (Carlen et al., 2009). Anks1a is a cytosolic adaptor with ankyrin repeats, two sterile alpha motifs (SAM), and a phosphotyrosine binding domain (PTB) (Shin et al., 2007; Uhlik et al., 2005). The role of Anks1a has been mainly investigated in the signaling pathway downstream of the epidermal growth factor receptor and Eph receptor (Kim et al., 2010; Shin et al., 2007; Tong et al., 2013). Importantly, a recent report indicated that Anks1a plays a role in facilitating the export of Eph receptor tyrosine kinases (RTKs) from the endoplasmic reticulum (ER)(Lee et al., 2016). However, the role of Anks1a in vivo, specifically, in the development of ependymal cells and the SVZ niche, has been barely studied to date. Notably, Numb and Ank3 have been implicated in the proper development of ependymal cells and the SVZ niche during post-natal brain development (Kuo et al., 2006; Paez-Gonzalez et al., 2011). Numb contains a PTB domain but not ankyrin repeats and SAM domain, whereas Ank3 contains ankyrin repeats but not SAM and PTB domains. It was also shown that expression of the PTB domain-deleted Anks1a interrupted the proper development of the ependymal tissue and subsequently induced a severe hydrocephalic phenotype (Park et al., 2015). In this aspect, it is interesting to speculate that both ankyrin repeats and the PTB domain may play distinct roles in the development of the VZ-SVZ during postnatal brain development. In this study, we used Anks1a-deficient mice to demonstrate that Anks1a plays a pivotal role in the proper development of ependymal cells during postnatal brain development. Anks1a gene-trap mutant mice have been described previously (Kim et al., 2010). For green fluorescent protein (GFP) expression analysis, we used Anks1a BAC (RP23-258K7) transgenic mice containing a floxed GFP cassette followed by the Anks1a-dPTB expression cassette as previously described (Park et al., 2015). All mice were handled in accordance with the institutional guidelines approved by the Sookmyung Women’s University Animal Care and Use Committee. For X-gal staining, embryos or brains were dissected in phosphate-buffered saline (PBS), fixed in 0.2% glutaraldehyde for 10 min, washed three times with PBS, and subjected to staining as previously described (Noh et al., 2016). For immunohistochemical analysis, brains were collected from mice at the indicated postnatal stages, fixed in 4% para-formaldehyde, washed in PBS, immersed sequentially in 30% sucrose and 30% sucrose/50% OCT at 4°C, and finally embedded in 100% OCT at −20°C. The embedded brains were cut into 25-μm sections and collected on coated slides. The sections were washed, blocked at room temperature, and incubated with primary antibodies overnight at 4°C. Sections were further incubated with species-specific secondary antibodies for 2 h and then washed prior to mounting with Hoechst in VECTASHIELD (Vector Laboratories). For dissection of the LW, mice at the indicated postnatal stages were perfused with PBS containing 4% paraformaldehyde and the brains were removed from the skull and fixed overnight at 4°C. Brains were further manipulated to reveal the lateral wall as previously described (Mirzadeh and Doetschet et al., 2010) and the whole mount LWs were washed three times in PBS containing 0.3% Triton X-100 for 10 min each. For staining of the LW, the whole mount tissue was blocked in PBS containing 10% horse serum and 0.3% Triton X-100 for 30 min and incubated with the primary antibodies overnight. The whole mount tissue was further incubated with species-specific secondary antibodies and Hoechst, washed in PBS, and mounted in VECTASHIELD (Vector Laboratories). The indicated IRES-GFP expression constructs were purified using EndoFree Plasmid Kit (Quiagen Maxiprep Kit, cat.no. 12362) according to the manufacturer’s instruction. For electroporation, DNA solutions (final concentration 2 μg/μl) containing 1% Fast Green were prepared in glass capillaries. The glass capillary was inserted into the lumen of the lateral ventricle and 1 μl of DNA solution was slowly injected as described (Feliciano et al., 2013). The injected pups were placed on the 37°C heating plate for 15 min and returned to their mother. After 15 days, brains were extracted and subjected to immunohistochemical staining. The polyclonal chicken GFP antibody used in this study was purchased from Abcam, while the polyclonal rabbit Anks1a antibody used was purchased from Bethyl Laboratories. Monoclonal mouse S100β and GFAP antibodies used in this study were purchased from Sigma Aldrich, and the monoclonal mouse glutamate aspartate transporter (GLAST) antibody was purchased from EMD Millipore. To identify the prominent expression region of Anks1a during the development of the mouse brain, we performed LacZ staining analysis using Anks1a heterozygous mice carrying a β-geo gene trap (Kim et al., 2010). 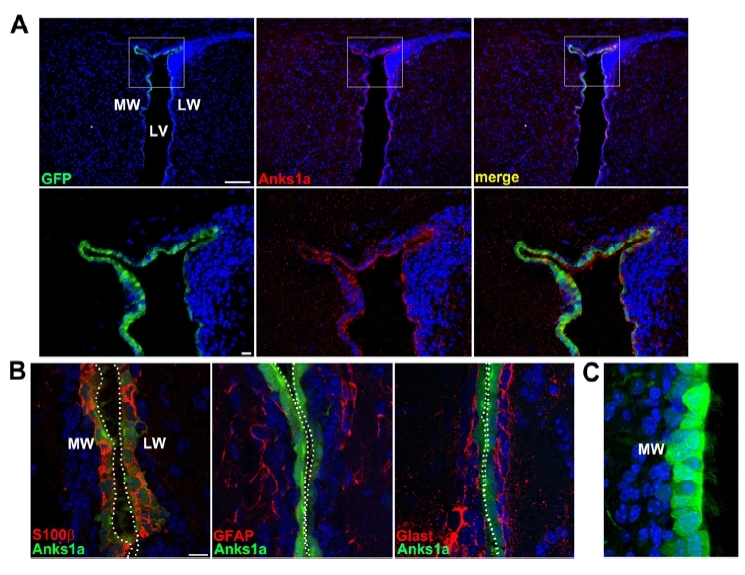 We found that Anks1a was strongly expressed in cells lining the lateral ventricle (LV) and that its expression was detected first in the medial wall (MW) and later in the lateral wall (LW)(Figs. 1A–1D). We focused on analyzing the expression pattern of Anks1a in the LW, a crucial region for brain homeostasis and regeneration (Codega et al., 2014; Ihrie and Alvarez-Buylla, 2011). In the LW, Anks1a expression began in the SVZ or VZ on postnatal day (P) 0. However, Anks1a expression was restricted mainly to the ventricular zone after P5. In addition, Anks1a expression was restricted to the cell layer lining the LV of the adult brain (Fig. 1E). 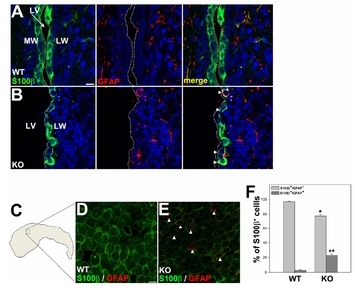 It was reported that RGCs give rise to ependymal cells in posterior-to-anterior and ventral-to-dorsal direction along the LW of the mouse LV (Spassky et al., 2005). Our results showed that the temporal and spatial expression pattern of Anks1a during the first 2 weeks of postnatal brain development roughly matched the sequential differentiation pattern of ependymal cells in the LW. To further investigate whether Anks1a is specifically expressed in mature ependymal cells, we used Anks1a BAC transgenic mice in which the GFP reporter recapitulates the endogenous expression pattern of Anks1a (Park et al., 2015). As expected, GFP fluorescence at P20 was co-localized with Anks1a detected using specific antibodies in cells lining the LV (Fig. 2A). In addition, GFP expression was well co-localized with S100β an ependymal cell marker, but not type B cell markers including glial fibrillary acidic protein (GFAP) or GLAST (Fig. 2B). We also found that ependymal cells with a robust expression of GFP at P5 contained motile cilia bundles (Fig. 2C), suggesting that Anks1a plays a role in the development of ependymal cells during postnatal brain development. We investigated whether ependymal cells in the LW were properly differentiated in Anks1a-deficient mice on P15. Ependymal cells in wild-type (WT) littermates were S100β-positive but barely GFAP-positive (Fig. 3A). In contrast, some ependymal cells in Anks1a knockout (KO) mice were not only S100β-positive but were GFAP-positive (Fig. 3B): the number of cells positive for both S100β and GFAP increased by seven-fold in KO mice (Fig. 3F). Furthermore, whole mount immunohistochemical staining of the LW revealed that the overall level of S100β was reduced in the Anks1a KO ependymal cells and that some of these cells also contained GFAP, the type B cell marker (Figs. 3C–3E). We also used GLAST as a marker for type B cells in the LW to assess whether Anks1a-deficient cells are prematurely differentiated. As we expected, WT ependymal cells were S100β-positive but barely GLAST-positive (Fig. 4A), while some of the KO ependymal cells were both S100β- and GLAST-positive (Fig. 4B). The number of double-positive cells with GLAST increased by three-fold in KO mice (Fig. 4E). Similarly, whole mount immunohistochemical staining of the LW showed that the overall level of S100β was low in the Anks1a KO ependymal cells and that some of these cells also contained GLAST (Figs. 4C and 4D). These results strongly suggest that in the absence of Anks1a, ependymal cells do not properly develop. We further investigated whether the ectopic expression of Anks1a in RGCs promotes the differentiation of ependymal cells. To test this possibility, we performed neonatal brain electroporation of the Anks1a-expressing plasmid. The expression vector was injected into the LV of mice brains on P1 or P2 (Figs. 5A and 5B)(Feliciano et al., 2013). Strikingly, we found that the overexpression of Anks1a in the LW resulted in a severe hydrocephalic phenotype on P20 and that the LWs of these brains contained multiple layers of S100β-positive cells (Fig. 5C). Altogether, these findings strongly suggest that Anks1a plays a role in promoting the proper development of RGCs into ependymal cells during early postnatal brain development. In this report, we found that Anks1a is expressed in RGCs of the neonatal brain and that its expression plays a pivotal role in the development of ependymal cells. A critical question is “how does Anks1a regulate the development of ependymal cells during postnatal brain development?” Our recent report revealed that Anks1a is a phosphoregulatory protein located in the ER for simultaneous binding to RTK cargo and Sec23. Ankyrin repeats and PTB domain in Anks1a are critical for interaction with EphA2 RTK and Sec23, respectively (Lee et al., 2016). Although some studies revealed that Eph receptors play a role in the development of the VZ-SVZ in the mouse brain (Conover et al., 2000; Holmberg et al., 2005), Eph receptor expression was not observed in the ependymal cell layer during postnatal brain development. However, we do not rule out the possibility that certain types of Eph receptors are expressed in ependymal cells since the large number of Eph-related receptors along with ineffective antibodies may have affected our results. Alternatively, Anks1a may play a role in facilitating the export of other classes of transmembrane proteins from the ER. N-cadherin and PCP proteins have been reported to be critical for the function of ependymal cells (Bayly and Axelrod, 2011; Paez-Gonzalez et al., 2011). These cell surface receptors may be cargo proteins whose transport is regulated by Anks1a in the ER. This hypothesis remains to be further addressed in our future work. If our hypothesis is correct, Anks1a-deficient ependymal cells would show a severe defect in the junctional structure and/or defective PCP signaling. These defects would affect the proper development of ependymal cells as shown in the present study. Our results also showed that some Anks1a-deficient ependymal cells express GFAP and/or GLAST, markers for type B cells, suggesting that ependymal cell fate is partially altered due to Anks1a deficiency in the developing ependyma. It was previously reported that Numb and Ank3 have a role in the development of ependymal cells (Kuo et al., 2006; Paez-Gonzalez et al., 2011), suggesting that PTB and Ankyrin repeats have a role in the proper development of ependymal cells. In addition, it was found that inhibition of Notch signaling is critical for the ependymal cell fate determination (Spassky and Meunier, 2017). Therefore, it is conceivable that Anks1a, together with Numb and Ank3, may be involved in modulating the Notch signaling in the ependymal cell fate determination. Alternatively, since FoxJ1 and Six3 are the crucial transcription factors for ependymal cell differentiation, it would be interesting to investigate whether Anks1a gene expression is regulated by those factors during ependymal differentiation process. Notably, de novo mutations of Anks1a were observed in some human patients with neurological disorders such as schizophrenia and autism (De Rubeis et al., 2014; Fromer et al., 2014). Therefore, further studies on the functional roles of Anks1a in the VZ-SVZ during early brain development would be very important in understanding the etiology of various neurodevelopmental disorders including congenital hydrocephalus, autism, and schizophrenia. Mol. Cells.Mar 31, 2019; 42(3): 245-251. Received November 22, 2018; Accepted January 31, 2019. Bayly, R., and Axelrod, J.D. (2011). Pointing in the right direction: New developments in the field of planar cell polarity. Nat Rev Genet. 12, 385-391. Carlen, M., Meletis, K., Goritz, C., Darsalia, V., Evergren, E., Tanigaki, K., Amendola, M., Barnabe-Heider, F., Yeung, M.S., and Naldini, L. (2009). Forebrain ependymal cells are notch-dependent and generate neuroblasts and astrocytes after stroke. Nat Neurosci. 12, 259-267. Codega, P., Silva-Vargas, V., Paul, A., Maldonado-Soto, A.R., Deleo, A.M., Pastrana, E., and Doetsch, F. (2014). Prospective identification and purification of quiescent adult neural stem cells from their in vivo niche. Neuron. 82, 545-559. Conover, J.C., Doetsch, F., Garcia-Verdugo, J.M., Gale, N.W., Yancopoulos, G.D., and Alvarez-Buylla, A. (2000). Disruption of eph/ephrin signaling affects migration and proliferation in the adult subventricular zone. Nat Neurosci. 3, 1091-1097. De Rubeis, S., He, X., Goldberg, A.P., Poultney, C.S., Samocha, K., Cicek, A.E., Kou, Y., Liu, L., Fromer, M., and Walker, S. (2014). Synaptic, transcriptional and chromatin genes disrupted in autism. Nature. 515, 209-215. Feliciano, D.M., Lafourcade, C.A., and Bordey, A. (2013). Neonatal subventricular zone electroporation. J Vis Exp. 11, . Fromer, M., Pocklington, A.J., Kavanagh, D.H., Williams, H.J., Dwyer, S., Gormley, P., Georgieva, L., Rees, E., Palta, P., and Ruderfer, D.M. (2014). De novo mutations in schizophrenia implicate synaptic networks. Nature. 506, 179-184. Guirao, B., Meunier, A., Mortaud, S., Aguilar, A., Corsi, J.M., Strehl, L., Hirota, Y., Desoeuvre, A., Boutin, C., and Han, Y.G. (2010). Coupling between hydrodynamic forces and planar cell polarity orients mammalian motile cilia. Nat Cell Biol. 12, 341-350. Holmberg, J., Armulik, A., Senti, K.A., Edoff, K., Spalding, K., Momma, S., Cassidy, R., Flanagan, J.G., and Frisen, J. (2005). Ephrin-A2 reverse signaling negatively regulates neural progenitor proliferation and neurogenesis. Genes Dev. 19, 462-471. Ihrie, R.A., and Alvarez-Buylla, A. (2011). Lake-front property: A unique germinal niche by the lateral ventricles of the adult brain. Neuron. 70, 674-686. Jacquet, B.V., Salinas-Mondragon, R., Liang, H., Therit, B., Buie, J.D., Dykstra, M., Campbell, K., Ostrowski, L.E., Brody, S.L., and Ghashghaei, H.T. (2009). FoxJ1-dependent gene expression is required for differentiation of radial glia into ependymal cells and a subset of astrocytes in the postnatal brain. Development. 136, 4021-4031. Kim, J., Lee, H., Kim, Y., Yoo, S., Park, E., and Park, S. (2010). The SAM domains of anks family proteins are critically involved in modulating the degradation of EphA receptors. Mol Cell Biol. 30, 1582-1592. Kriegstein, A., and Alvarez-Buylla, A. (2009). The glial nature of embryonic and adult neural stem cells. Annu Rev Neurosci. 32, 149-184. Kuo, C.T., Mirzadeh, Z., Soriano-Navarro, M., Rasin, M., Wang, D., Shen, J., Sestan, N., Garcia-Verdugo, J., Alvarez-Buylla, A., and Jan, L.Y. (2006). Postnatal deletion of numb/numblike reveals repair and remodeling capacity in the subventricular neurogenic niche. Cell. 127, 1253-1264. Lavado, A., and Oliver, G. (2011). Six3 is required for ependymal cell maturation. Development. 138, 5291-5300. Lee, H., Noh, H., Mun, J., Gu, C., Sever, S., and Park, S. (2016). Anks1a regulates COPII-mediated anterograde transport of receptor tyrosine kinases critical for tumorigenesis. Nat Commun. 7, 12799. Manzini, M.C., and Walsh, C.A. (2011). What disorders of cortical development tell us about the cortex: One plus one does not always make two. Curr Opin Genet Dev. 21, 333-339. Mirzadeh, Z., Doetsch, F., Sawamoto, K., Wichterle, H., and Alvarez-Buylla, A. (2010). The subventricular zone en-face: Wholemount staining and ependymal flow. J Vis Exp. 6, . Mirzadeh, Z., Han, Y.G., Soriano-Navarro, M., Garcia-Verdugo, J.M., and Alvarez-Buylla, A. (2010). Cilia organize ependymal planar polarity. J Neurosci. 30, 2600-2610. Neale, B.M., Kou, Y., Liu, L., Ma’ayan, A., Samocha, K.E., Sabo, A., Lin, C.F., Stevens, C., Wang, L.S., and Makarov, V. (2012). Patterns and rates of exonic de novo mutations in autism spectrum disorders. Nature. 485, 242-245. Noh, H., Lee, H., Park, E., and Park, S. (2016). Proper closure of the optic fissure requires ephrin A5-EphB2-JNK signaling. Development. 143, 461-472. Ohata, S., and Alvarez-Buylla, A. (2016). Planar organization of multiciliated ependymal (E1) cells in the brain ventricular epithelium. Trends Neurosci. 39, 543-551. Paez-Gonzalez, P., Abdi, K., Luciano, D., Liu, Y., Soriano-Navarro, M., Rawlins, E., Bennett, V., Garcia-Verdugo, J.M., and Kuo, C.T. (2011). Ank3-dependent SVZ niche assembly is required for the continued production of new neurons. Neuron. 71, 61-75. Park, S., Lee, H., and Park, S. (2015). In vivo expression of the PTB-deleted odin mutant results in hydrocephalus. Mol Cells. 38, 426-431. Shin, J., Gu, C., Park, E., and Park, S. (2007). Identification of phosphotyrosine binding domain-containing proteins as novel downstream targets of the EphA8 signaling function. Mol Cell Biol. 27, 8113-8126. Spassky, N., Merkle, F.T., Flames, N., Tramontin, A.D., Garcia-Verdugo, J.M., and Alvarez-Buylla, A. (2005). Adult ependymal cells are postmitotic and are derived from radial glial cells during embryogenesis. J Neurosci. 25, 10-18. Spassky, N., and Meunier, A. (2017). The development and functions of multiciliated epithelia. Nat Rev Mol Cell Biol. 18, 423-436. Tissir, F., Qu, Y., Montcouquiol, M., Zhou, L., Komatsu, K., Shi, D., Fujimori, T., Labeau, J., Tyteca, D., and Courtoy, P. (2010). Lack of cadherins Celsr2 and Celsr3 impairs ependymal ciliogenesis, leading to fatal hydrocephalus. Nat Neurosci. 13, 700-707. Tong, J., Sydorskyy, Y., St-Germain, J.R., Taylor, P., Tsao, M.S., and Moran, M.F. (2013). Odin (ANKS1A) modulates EGF receptor recycling and stability. PLoS One. 8, e64817. Uhlik, M.T., Temple, B., Bencharit, S., Kimple, A.J., Siderovski, D.P., and Johnson, G.L. (2005). Structural and evolutionary division of phosphotyrosine binding (PTB) domains. J Mol Biol. 345, 1-20. (A–D) The whole brains of Anks1a heterozygous mice at the indicated embryonic or postnatal days were processed for cryostat sectioning. Coronal sections of the brain were subjected to X-gal staining to reveal LacZ-positive cells lining the lateral ventricle. cc, corpus callosum; ChPl, choroid plexus; CP, caudate putamen; Cx, cerebral cortex; LV, lateral ventricle; LW, lateral wall; MW, medial wall. Scale bars, 1 mm. The boxes in A–C were enlarged in A′–C′. Scale bar for A′, 250 μm. (E) The lateral wall (LW) of Anks1a heterozygous mice on P45 was subjected to whole mount X-gal staining. Note that ependymal cells in the LW display prominent X-gal staining. At least three embryos or mice were analyzed at each developmental stages and the results were reproducible. (A) The whole brains of Anks1a BAC transgenic mice at P20 were processed for cryostat sectioning. Coronal sections of the brains were subjected to immunohistochemical staining by using anti-Anks1a antibodies to analyze the co-localization of Anks1a with GFP. Scale bars, 200 μm for top panels and 25 μm for bottom panels. (B) Experiments were performed as described in panel A, with the exception that the Anks1a antibody was replaced with the indicated antibodies. GFP fluorescence represents Anks1a expression in this panel. (C) Ependymal cells with intense GFP signal show multi-cilia, suggesting that these are mature ependymal cells. Three independent trans-genic mice were analyzed and 8 adjacent sections on each slide were subjected to immunohistochemical staining. Scale bars for panel B and C, 20 μm. (A–B) The whole brains of wild type (WT) and knockout (KO) mice at P15 were processed for cryostat sectioning. The coronal sections were subjected to immunohistochemical staining using both GFAP and S100β antibodies. Note that some of the S100β-positive cells also expressed GFAP, a type B cell marker (marked with arrowheads). Scale bar, 20 μm. (C) Schematic diagram of the dissected LW. The small box represents the region shown in panels D and E. (D and E) The LWs of WT and KO mice at P15 were subjected to whole mount histochemical staining using the indicated antibodies. 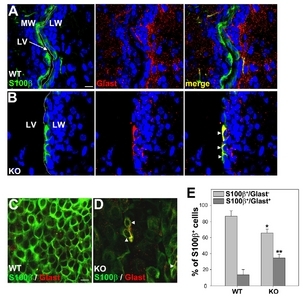 Note that ependymal cells which were positive for GFAP in the LWs of KO mice also expressed low levels of S100β (marked with arrowheads). Scale bar, 10 μm. (F) The data in panels A and B were quantified and presented as mean ± standard deviation (SD). *p < 0.01; **p <.001 (five adjacent sections for each mouse (n = 5) and littermate (n = 5) were analyzed for comparison). WT versus KO for S100β+ cells, unpaired t-test. (A–D) Experiments were performed essentially as described in Figs. 3A–3E, with the exception that the GLAST antibody was used in this experiment. Arrowheads represent S100β-positive cells also expressing Glast. Scale bars, 20 μm for panel A and 10 μm for panel C. (E) The data in panels A and B were quantified and presented as mean ± standard deviation (SD). *p < 0.01; **p < 0.005 (Five adjacent sections for each mouse (n = 5) and littermate (n = 5) were analyzed for comparison). WT versus KO for S100β+ cells, unpaired t-test. (A) The schematic structure of the expression vectors for electroporation. (B) The expression vectors were directly injected into the LVs of newborn mice and then electrically pulsed into the LW. Mice were allowed to live for 15 days and then sacrificed for further analysis. (C) The whole brains were photographed for morphological comparison (top panel). The brains were further processed for cryostat sectioning. Coronal sections of the brains were subjected to immunohistochemical staining using the S100β antibody (bottom panel). Note that brains injected with the Anks1a-expressing vector displayed severe hydrocephaly and contained significantly more ependymal cells. Similar results were reproducibly observed in three independent injection experiments (the total number of mice for control and Anks1a vector was 5, respectively). Scale bar, 20 μm. (D) The data in panel C were quantified and presented as mean ± standard deviation (SD). **p < 0.001 (four adjacent sections for each mouse (n = 5) were analyzed for comparison). Control versus Anks1a for S100β+ cells, unpaired t-test.